Have you ever noticed water flowing down the street when it rains? Have you ever wondered where the water flows to? Have you thought about what’s in the water? When it rains onto a forest or a field, some of that rain is absorbed by the ground, replenishing groundwater that is used by many for drinking water. Some of the rain is taken up by plants, and some of it simply evaporates. But very little of the rain flows over the ground. In a more developed setting, such as our cities and towns, rain falls onto pavement, or other surfaces such as roofs, sidewalks, parking lots, and driveways that don’t allow the water to be absorbed by the ground. The water that you see flowing down the street is called stormwater runoff. 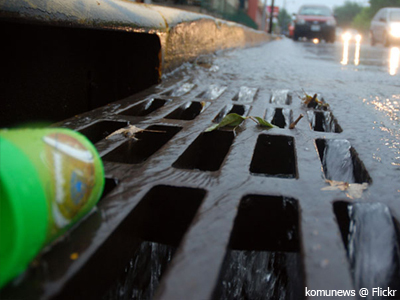 When stormwater hits the pavement, it picks up and mixes with what’s there.